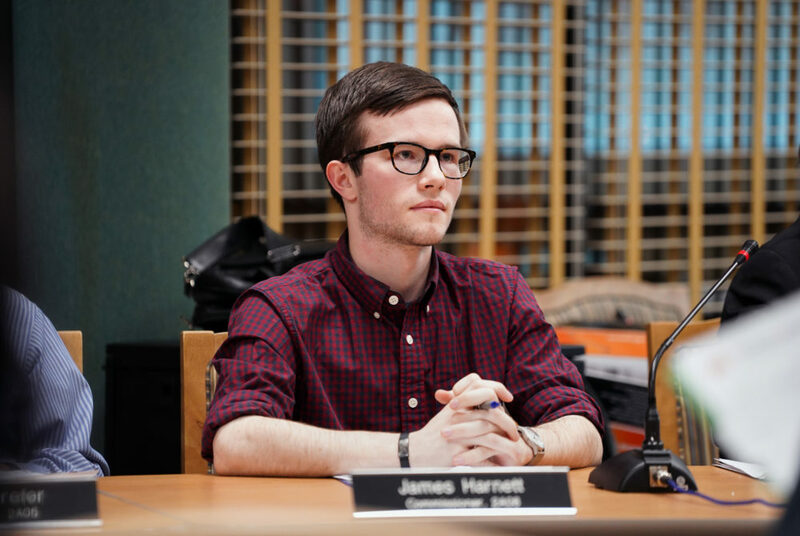 Junior and ANC Commissioner James Harnett said the resolution, combined with a push to establish a protected bike lane that would run through campus, would give students safer options to navigate the District. A local governing group passed two transportation resolutions and heard noise complaints at a meeting Wednesday. The Foggy Bottom and West End Advisory Neighborhood Commission approved two pieces of legislation boosting the number of bikes and Capital Bikeshare stations on campus and piloting a traffic lane reserved for buses on H and I streets this summer. Commissioners unanimously passed a resolution to increase the number of bikes on campus and expand a bikeshare station on 21st and I streets NW to occupy multiple parking spaces. Junior and ANC Commissioner James Harnett said the resolution, combined with a push to establish a protected bike lane that would run through campus, would give students safer options to navigate the District. He also said the resolution would increase the number of affordable transportation options in the District. “There are a number of issues where students don’t feel like there are cheap, affordable, non-Uber, non-Lyft ways to get around, and I want to help support that,” Harnett said. Commissioners also unanimously passed a resolution presented by the District Department of Transportation that would create bus lanes during peak rush hours on H and I streets this summer. The H Street bus lane will run between 14th and 18th streets, and the I Street bus lane will run between 13th and 20th streets. DDOT will paint the curb lanes of the two streets red and designate them as bus lanes during peak rush hour to help clear up traffic from the beginning of June to the end of September. Hayley Peckett, a planner for DDOT, said the department has studied the area for several years and wants to “actually put something on the ground.” She said DDOT will monitor issues like pedestrian safety and bus travel times to determine how the project could be improved. “We hope this will make things better and we’re prepared to make some tactical improvements over the course of the pilot because we’ll be monitoring all these data sources to keep things working better,” Peckett said. Commissioners also listened to noise complaints from Watergate Hotel building residents regarding commercial deliveries and construction. “I don’t need an alarm clock, I know exactly when your flowers and your bread are being delivered,” Paz said. Commissioners told Watergate Hotel representatives at the meeting that steps needed to be taken to mitigate the noise from delivery trucks idling illegally outside the hotel. Chairman William Kennedy Smith said the hotel’s upcoming Alcoholic Beverage Regulation Administration license could struggle to be renewed if action was not taken to alleviate the noise. “Peace, order and quiet – that is the basis of an ABRA protest, and you will get protested if this does not stop,” Smith said. Pascal Forotti, the managing director at the Watergate Hotel, said he is looking into working with the hotel’s vendors to draft solutions to the complaints. “I want to be a great neighbor but make sure that this is obviously not something that is disturbing you anymore and no longer on my desk, so that we can really focus on what the hotel should be,” Forotti said.